US Weight defines public venues as stadiums/arenas, cinemas, conference centers, theme/water parks, restaurants, or any other location where large crowds gather. All of these venues have a single attribute in common: people want to be inside rather than waiting in line! 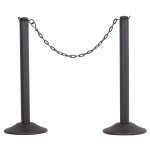 US Weight products can assist in effectively steering large crowds through ticket lines, concession stands and many other areas within your venue. Our experience suggest, that the quicker a person can navigate a queue system and get inside, the more satisfied that individual is. 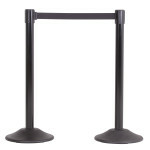 In addition to offering quality stanchions, we can also help develop your brand by adding a customized base covers to your US Weight steel stanchions. Help further develop your brand name or advertise a promotion by taking advantage of the few moments a person stands in your queue.